The decision on the Eileen House planning application, 335 flats, 41 stories has been delayed once more. The public hearing that was to be held 24 Oct at City Hall has been postponed for ‘procedural reasons’. Previous hearings in March and February were also cancelled. 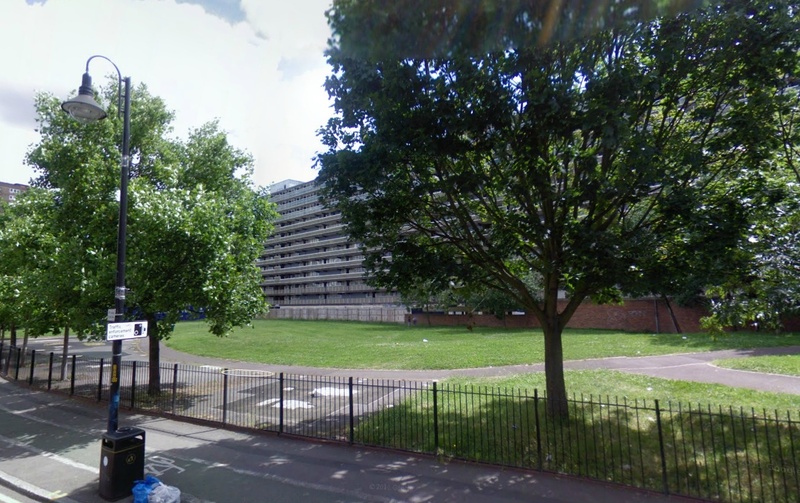 While Southwark’s housing waiting list accelerates upwards, developers Oakmayne and the Ministry of Sound have battled over the fate of this key development site. The application was submitted in 2009 and rejected by Southwark in 2011. The power of decision was then taken over by Boris Johnson, who has been reviewing it ever since. 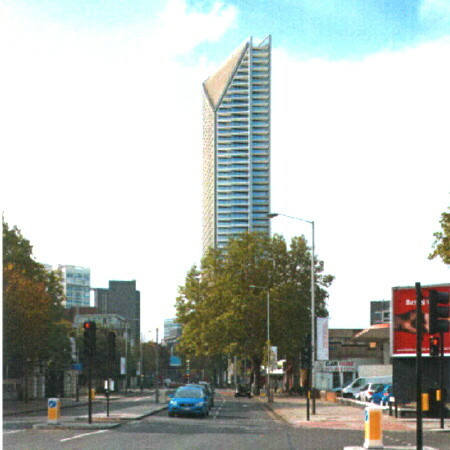 One of Southwark’s grounds for rejecting the application was that it has no social rented housing, but this wasn’t an obstacle for the Elephant’s other ‘Towers of Shame’ – Strata Tower, One the Elephant, St Mary’s residential, Tribeca Square– which don’t have a single social rented unit amongst their 1500 homes. The real obstacle has been determined objections from Ministry Of Sound, which fears future complaints from their new neighbours. MoS’s concerns are no doubt well founded and young people have a legitimate need to dance themselves silly, but in a sensible world this would be trumped by the need of others for somewhere to live – not that this need will be properly met by another social housing-free development. For its part Oakmayne should be told – no social housing means no planning approval, but the chances of Mayor Johnson taking this view are non-existent. MoS and Oakmayne pay lip-service to the aims of the regeneration but define it entirely in their own self-interested terms; local people (and Southwark Council) have been reduced to bystanders. __N.B. :__Oakmayne, like Strata Tower developers are registered as an offshore company on the Isle of Man and therefore pay no UK tax. This setup also enables it to legally sell its flats while avoiding the payment of stamp duty. Battle lines are also being drawn over the road at the Elephant shopping centre. Southwark Council leader Peter John told the council assembly that he expected shopping centre owners St Modwen to deliver a development plan by the end of the year. He ruled out refurbishment as an acceptable option. Previously head of regeneration Cllr Fiona Colley had also said the shopping centre would be demolished. St Modwen’s say very little, though there have been press reports that they might sell up, with Lendlease rumoured as purchasers. One thing continues unchanged – shopkeepers and their customers have been left out of this conversation. 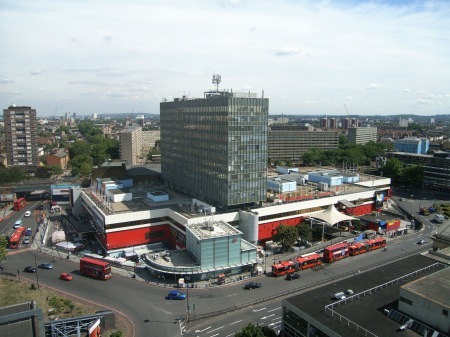 The shopping centre is much ridiculed, but an awful lot of people work, shop and socialise there and it is time they were brought into the arguments about its future. The consultation period for the second planning application for the Box Park has just ended, although comments will still be received by Southwark planning. The park has grown in size to 56 units (each a shipping container) and been moved down the road from the Shell garage to the corner of Walworth Rd and Elephant Rd, formerly Elephant Park. Many remember that the London Latin American community used to have a football league here, before the Park had to be given up to the Tribeca Square development; developers Delancey say they can manage without it after all, so it now looks like a needless sacrifice. This aside, nearby Wansey St residents welcome the move of the Box Park away from their immediate vicinity. Other changes include the name (it is now known as The Artworks), dropping the live/work element of the proposal, which was met with scepticism from the many artists and artisans in the area, and the inclusion of a marketing suite for Lendlease, developers of the Heygate estate. Otherwise the application proposes a similiar mix of uses – retail, café, restaurant, indoor market, business workspace, gallery, community space – although the extent of each is not specified. It will be a temporary development for five years and the applicants are asking that the usual s106 contributions (for mitigating the impact of developments) be waived in this instance, partly because of its temporary nature, partly because the s106 benefits are supposedly included in the application already. Curiously, Artworks has not withdrawn the previous application for the Shell garage site, saying simply that it has ‘..yet to be determined by the Council’. The new application’s reference number is 13/AP/2927; planning documents can be found here.